1921: Lincoln: Willa Cather, Famous Nebraska Novelist, Says . . .
1924: New York: First Meeting . . .; Another Glimpse . . .; Willa Cather; Restlessness . . .
1925: New York: A Short Story Course . . .
1927: Hastings: Literature Leads to High Place . . .
1928: Superior: Famous Nebraska Authoress Visits . . .
1931: San Francisco: Willa Cather Tells . 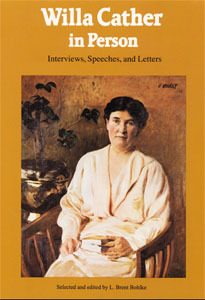 . .; Willa Cather Raps "Sincerity Heresy"
1931: New York: America's Twelve Greatest Women . . .